Converting nearly 100,000 lb. of steel coil per day into blanks at Morton Mfg. falls on the shoulders of this new precision blanking line, a 0.135-in.-capacity line from Red Bud Industries. Morton installed the line in August 2008 to replace a 1974-vintage Red Bud blanking line. builders since 1903, eyeing the freight-car repair market for opportunities to provide its manufactured products—running boards, brake steps, end platforms and intermodal platforms. The company, which occupies a 200,000-sq.-ft. facility that takes in two to three truckloads of steel per day, processes coils as wide as 48 in. that weigh as much as 30,000 lb. Most of what Morton processes is 11- to 14-gauge hot-rolled and pre-galvanized steel; it also yields 500,000 lb. of aluminum stock each year, and a bit of stainless steel as well. The overwhelming majority (80 percent) of the material processed at Morton runs through its seven blank-fed stamping presses, rated 400 to 800-ton capacity; one Minster press processes coil stock. 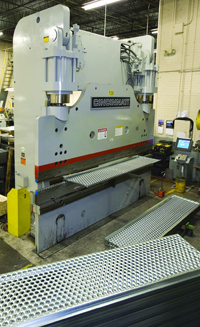 The newest addition to the firm’s pressroom is an 800-ton Clearing added in 2007. 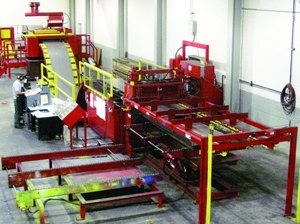 Additional value-added processing of the firm’s safety grating products—including products for the industrial market such as work platforms, stair treads, ladder rungs and walks—occurs at its three Amada turret presses, a Whitney plasma-punch machine, 25 press brakes, and welding and finishing lines. Converting nearly 100,000 lb. of steel coil per day into blanks at Morton Mfg. falls on the shoulders of its new precision blanking line, a 0.135-in.-capacity line from Red Bud Industries, Red Bud, IL. Morton installed the line in August 2008 to replace a 1974-vintage Red Bud blanking line that, while continued to run well, simply could not keep up with Morton’s work load. The overwhelming majority (80 percent) of the material processed at Morton runs through its seven blank-fed stamping presses, rated 400 to 800-ton capacity. The firm manufactures anti-slip walking surfaces for railroad-car builders, including running boards, brake steps, end platforms and intermodal platforms. to the proper width, automatic self-threading scrap chopper, hands-free threading system, dual-motor grip feed, shear, drop stacker and automatically lowering stack table. The 2008-vintage Red Bud not only runs faster than its older brother, but it also boasts a longer feed length, 84 in. compared to 48 in. This allows the line to process longer blanks with fewer feed strokes (with capacity to 14 ft.), and longer blanks are preferred by Morton’s customers to minimize the number of seams in the walking surfaces.